Let’s make a dashboard for analysis using the World Cup match results data. This document will show you how Metatron Discovery ‘s Data Prep function and workbook features can be used in your analysis. First, let’s get the data with World Cup matches result information. You can download data for the World Cup matches result in Excel format from Tableau’s Public Data site. Now let’s process the downloaded data using Data Prep. All accounts of metatron Discovery will be admin in this example. But, only users with Data Administrator privileges can use Data Prep in real-world. 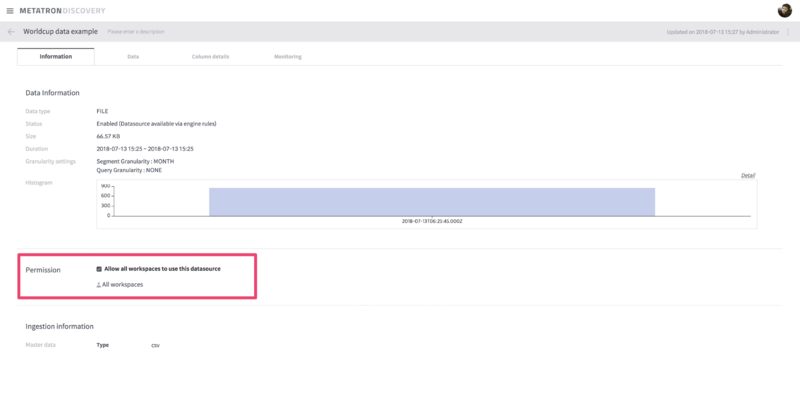 Log in as admin and go to “Management-> Data Preparation-> Dataset”. 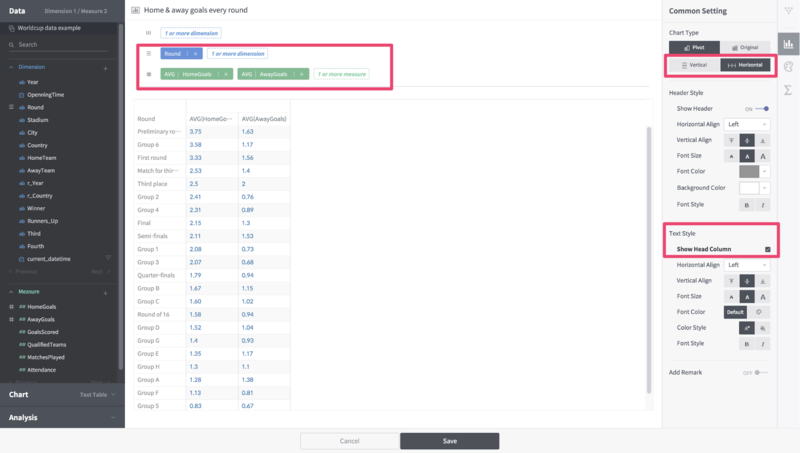 Now select the Generate “new dataset” button to create the new dataset. At this time, if a dialog box such as “Select a data type” appears, you have to select the data type. Select “File” because the imported data is an Excel file. 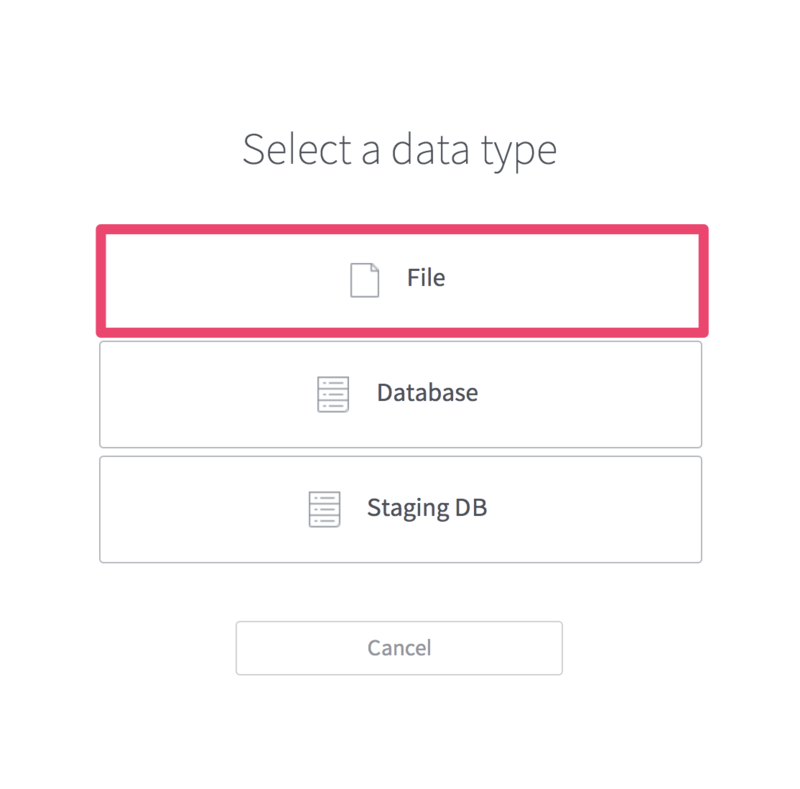 If you upload the downloaded file, you can select the sheet you want to create dataset. 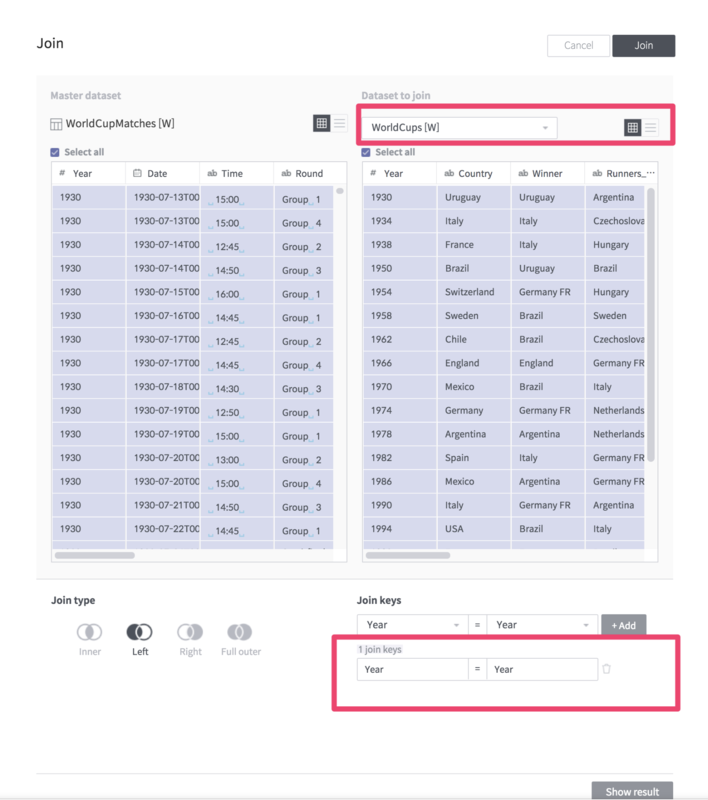 In this example, the sheets to be created with dataset are WorldCupMatches and WorldCups. Currently, metatron discovery can only create one dataset at a time. So to create two datasets with two sheets, you have to go through the same process. Now enter the dataset name for the selected data and finish creating it. 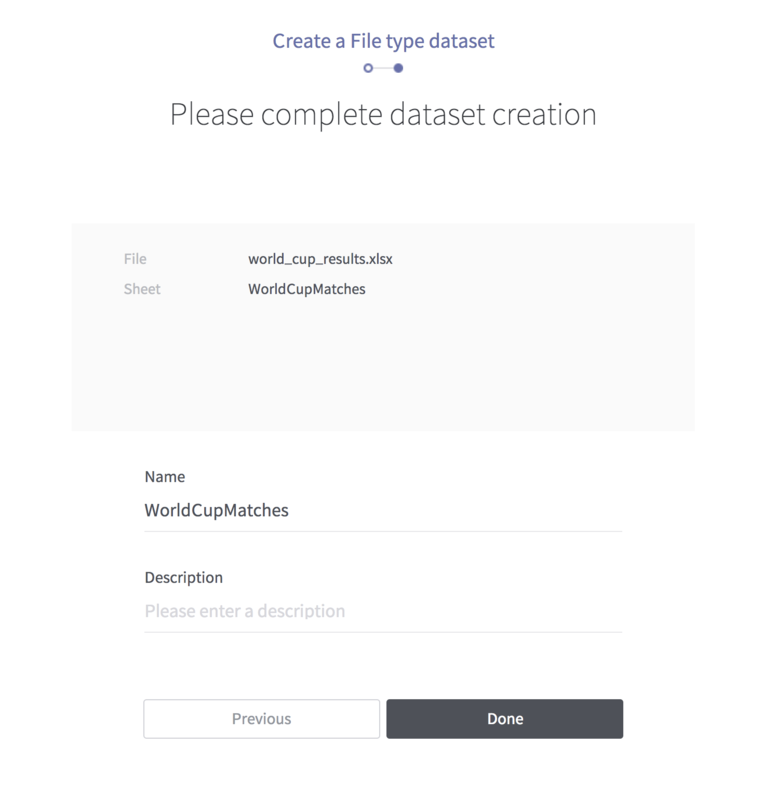 Create a dataset for the WorldCups sheet in the same way. Now create a dataflow using the two datasets we created earlier. 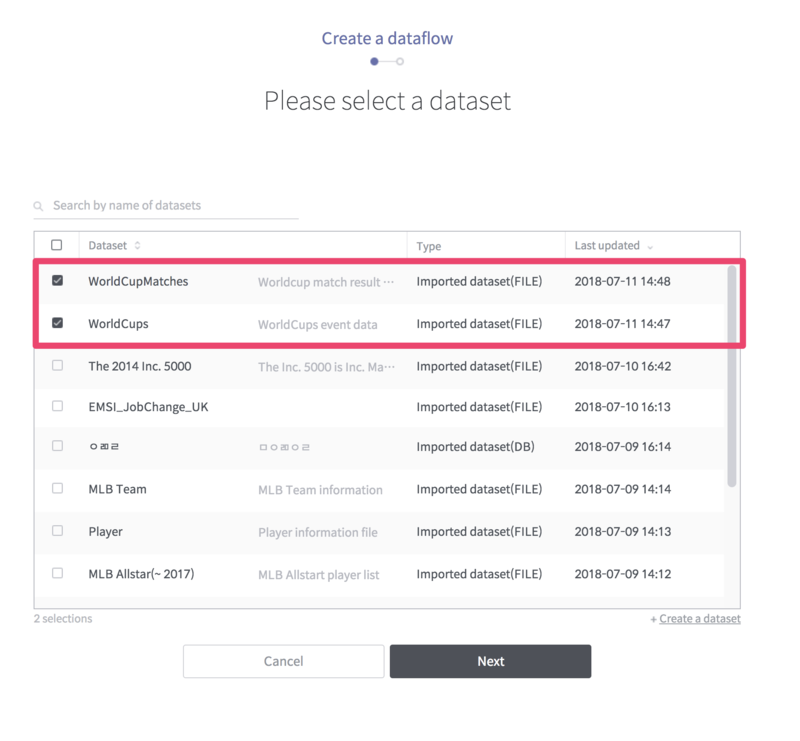 If you select the “Add a dataflow” button on the dataflow list view, you can see the screen to select dataset as follows. Select the dataset you created earlier. After this, enter the name of the dataflow and create it. Then the following dataflow detail view will appear. Select WorldcupMatches and select the “Edit rules” button. 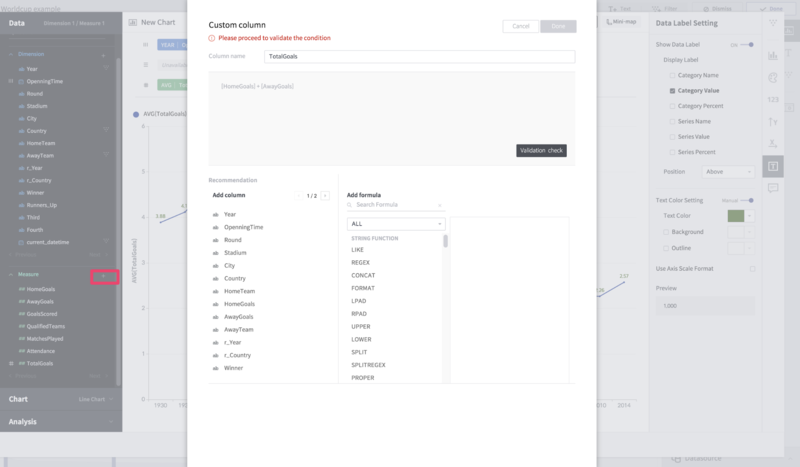 When you run “Edit rules”, you will see a screen where you can modify the rules applied to the dataset. We will join WorldcupMatches dataset and WorldCups dataset here. If you select join in the command box at the bottom, the compose window for join appears. 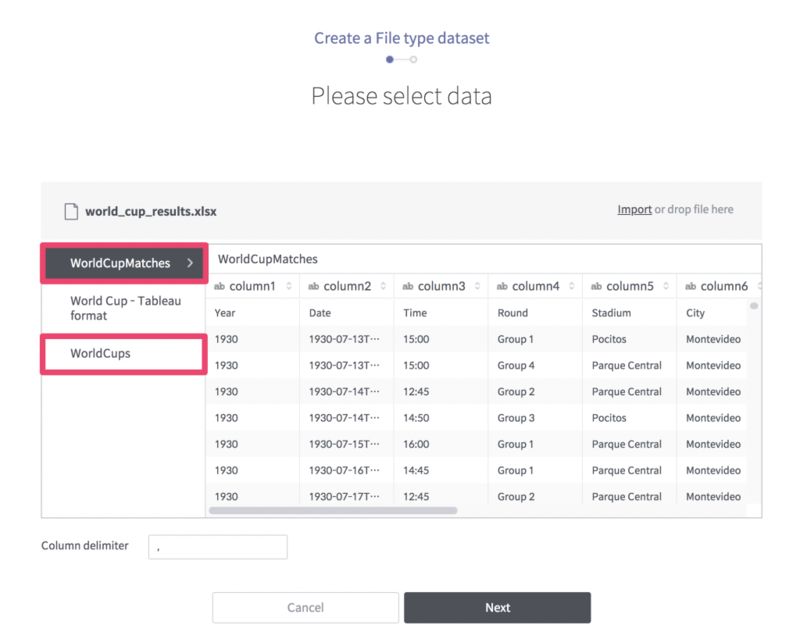 In the “Dataset to Join” selection box, select WorldCups and join the two datasets using the Year column. In addition to this, we execute several rules as follows. 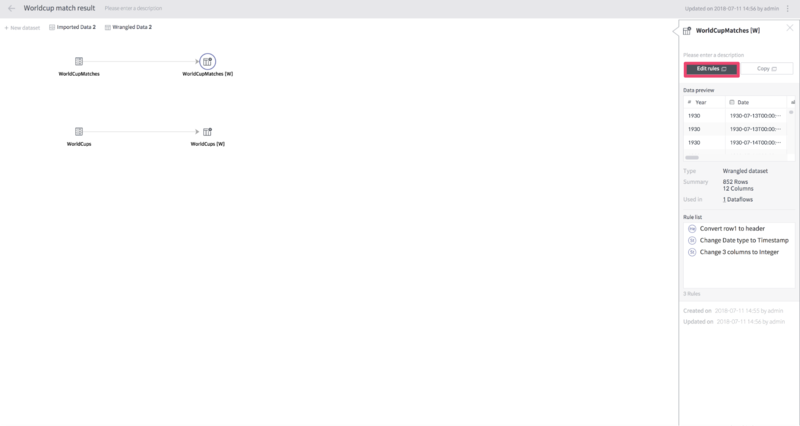 When you have finished creating the Rule, run the “Snapshot” button to create a data snapshot. The generated snapshot can be viewed from the “Data snapshot” menu, and the results can be downloaded as a CSV file format. Now we take a snapshot as a CSV file and create a datasource. You can create a new Datasource using the downloaded snapshot file. Go to “Management -> Data Storage -> Data source”. 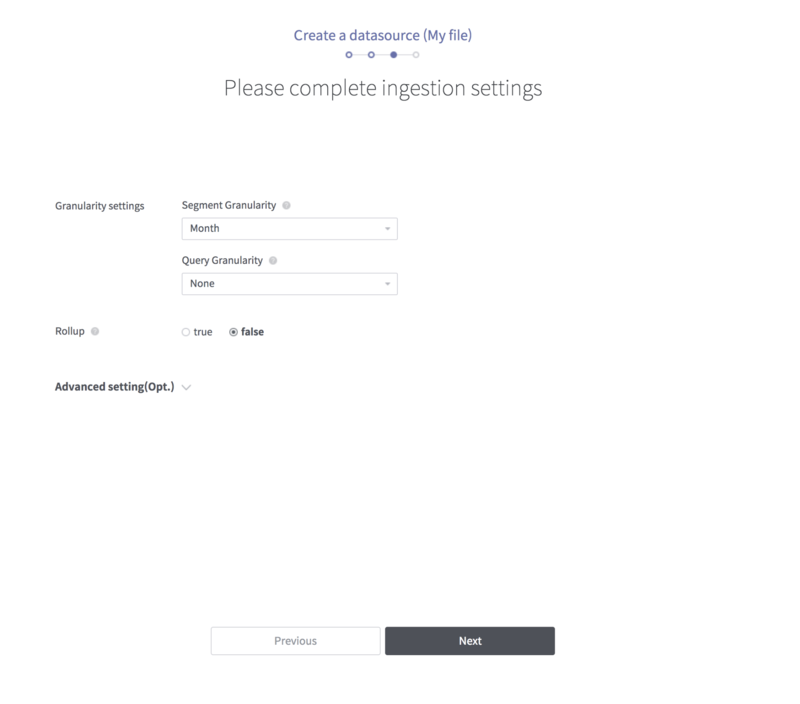 Select the “Create a new datasource” button here to create a new data source. A screen similar to the one shown when creating Dataset appears, select File. Dimension : Other fields. 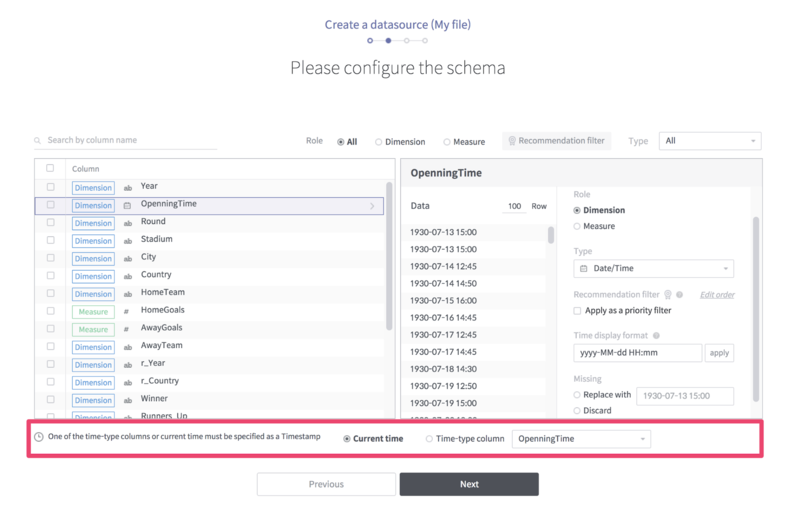 Specifies the type of OpenningTime as Date / Time. The next step is to set the Druid ingestion setting. 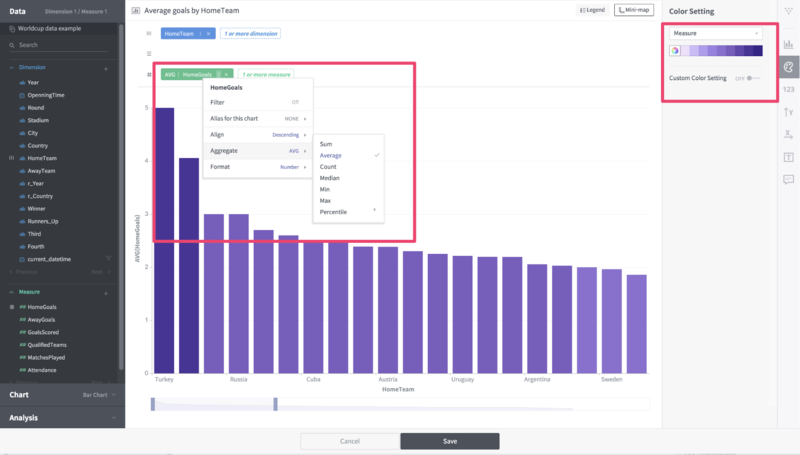 Specify Segment Granularity as Month, Query Granularity as None, and Rollup as false. Now name the data source and finish the creation. 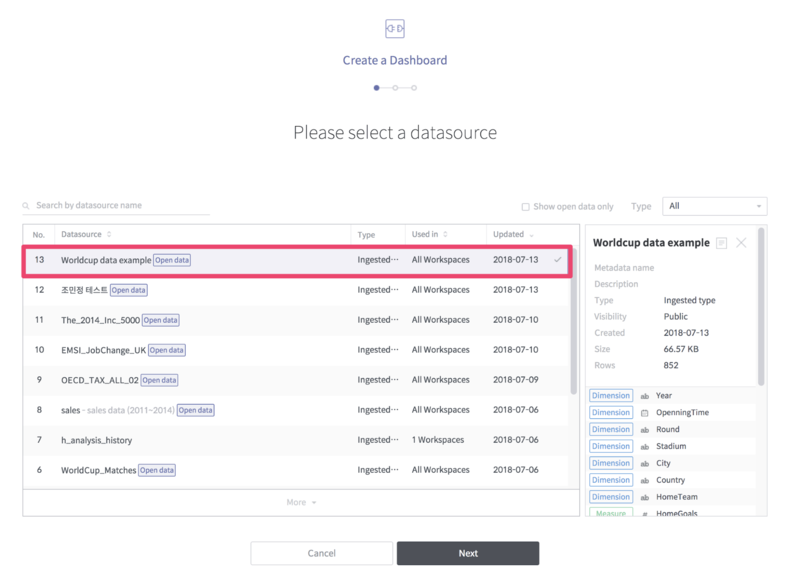 If the generated data source is enabled, check “Allow all workspaces to use this datasource” in the datasource detail view. The datasource is now ready to use. 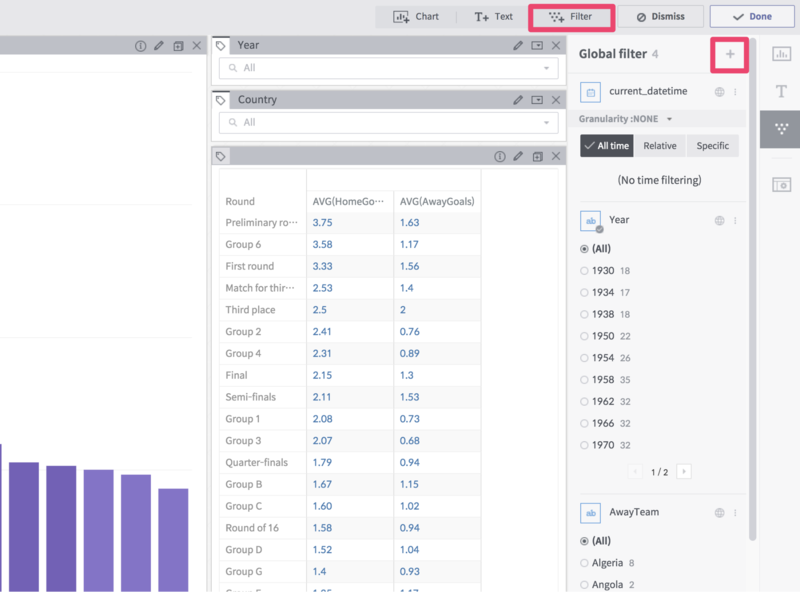 In the personal workspace, draw a chart using the World Cup datasource. 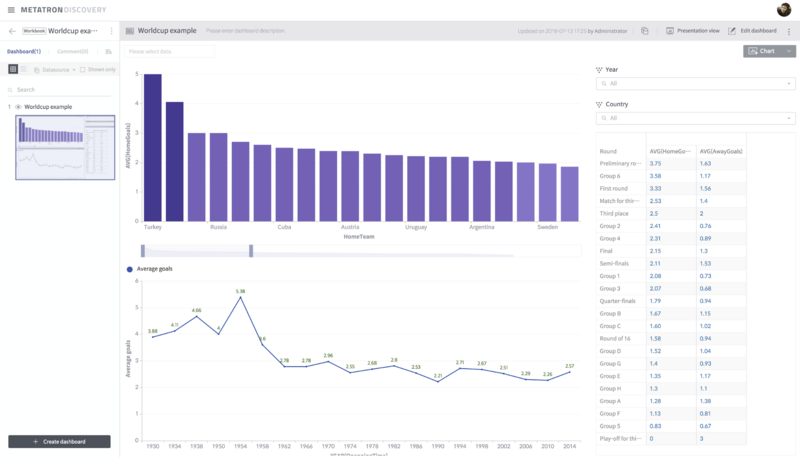 Configure the dashboard with the “Worldcup data example” datasource. 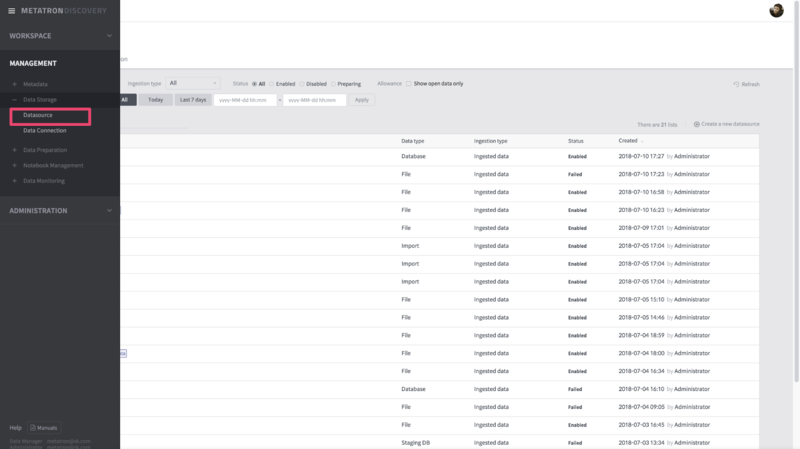 When you create a new workbook in your personal workspace, you will see a screen to select a data source. 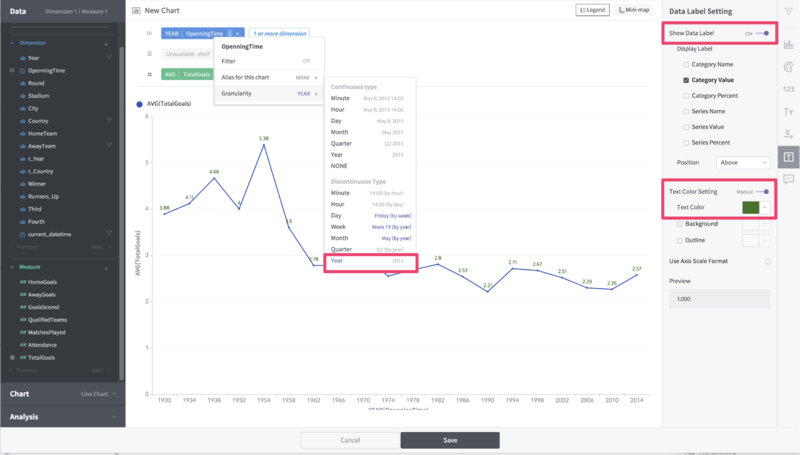 Select the “Worldcup data example” datasource here. Now create a new chart. First, draw the average score of the home team in a chart. Select HomeTeam on the column shelf, and HomeGoals on the cross shelf. The statistics of HomeGoals are average and align is descending. Select color as measure basis and save. Next, we create a table with the average number of goals per round. Now look at the average number of goals for each World Cup competition. Currently HomeGoals and AwayGoals exist, but you need a new Measure value that combines these two values. To do this, create a custom Measure value. Name the column TotalGoals and enter “[HomeGoals] + [AwayGoals]” as the formula. Now put the OpenningTime on the column shelf and TotalGoals on the cross shelf. Now, on the Edit Dashboard screen, add Year and Country as filters. Adjust the layout and save. 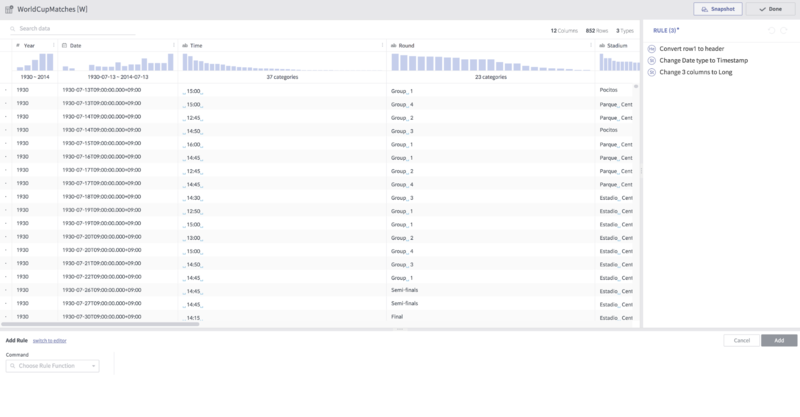 You can now perform correlation analysis between charts on the dashboard. If you select the desired parts of the chart, you can see that the other charts react together.